- 2019: Our Web site in now more secure with HTTPS. - 2018: Difficult year with less tourists in Nepal. 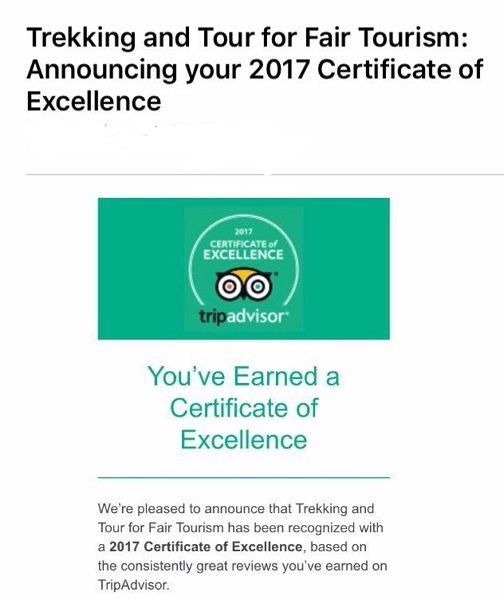 - 2017: TT4FT obtained the Certificate of Excellence from TripAdvisor. - January to February 2016: now fuel crisis in Nepal has been resolved as India started to supply again. 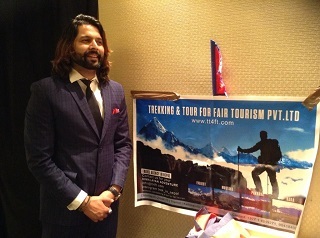 We had a stall promoting TT4FT company and Nepal tourism at the New York Couture Fashion week that featured Nepalese fashion. 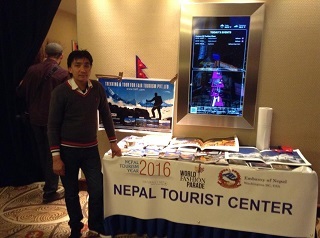 The event was held from 12 to 14 February 2016 at the Crown Plaza Hotel at Times Square. Our office manager Rajan Karki recently got married with her girlfriend from Australia, Ka Bo Kwong. Their wedding was held on 20 January 2016. On 24th of February Tara airline (twin-otter 9N AHH plane) has crashed at 8:00 am on the way from Pokhara to Jomsom in Ghoptebir myagdi. There were two foreign nationals on board - one Chinese woman and one Kuwait man. All the others are Nepali, including three crew members for a total of 23. There were no survivors. The crash was due to by dust clouds caused by dry landslide in the Annapurna region. - November 2015: Huge update of our web site. - October 2015: Nepal government has successfully signed a fuel trade deal with Chinese government. Nepal's parliament has elected a women's rights campaigner Bidhya Devi Bhandari as its first female president. - September 2015: Nepal has new constitution. The fuel crisis began on 23 September 2015 after constitution was made because India government sets restrictions to supply all fuel in Nepal. - April 2015: since 25th of April it has been a disaster in Nepal due to an earthquake and aftershocks. Nearly 8,000 people died, over 600,000 houses are destroyed. - December 2014: ending trekking season. It was marked by the snowstorm disaster mid October in the Annapurna and Dhaulagiri regions, more than 40 people died. We wish a very nice end of year to everybody. - September 2014: starting new trekking season. - Beginning of May 2014: company trekking license received, bank account opened. - Mid March 2014: starting new trekking season. - Week from 3rd to 7st of March 2014: first group from Thailand for a 3 days Phokara tour. - Weeks from 10th to 21st of February 2014: TT4FT Web site update. - 8th of February 2014: company office setup at Chhetrapati Chowk 17, Thamel, Kathmandu. - Week from 3rd to 7th of February 2014: TT4FT Web site update. - Week from 27th to 31st of January 2014: TT4FT Web site update. - 25th of January 2014: www.tt4ft.com registered and Web site hosting done. - 16th of January 2014: "Trekking and Tour for Fair Tourism" company name is registered to Company Registration Office in Kathmandu. - 27th of December 2013: Manoj and Dominique to lunch at Bharat's home. Discussions about what they want to do is they create a new company. Decision to setup a new company with the "Fair" principles, primaly focussing on trekking and tours.